COG bonding equipment (pre-press) referred to as “bonding machine,” “hot-press”, COG bonding equipment is to determine the IC chip on top of LCD glass finishing and binding equipment, machine controlled by a PLC + HMI composition core products in the completion of the bits and transmitted by the platform after preloading pressure to bind the crimp. Using ACF (Anisotropic conductive adhesive) by pressing the IC bonding directly to the LCD screen. After bonding the entire module is also through FPC (flexible printed circuit board) metal pin and PCB board connector or together. LCD screen, ACF, the driver IC are the three key components of COG. COG bonding equipment (preload) is widely used in a variety of LCD display (LCD), modules (LCM) and large-sized display panel production, assembly, maintenance, production enterprises; such as: mobile phones, laptops, LCD monitors, tablet PCs, LCD / LCM production, assembly, repair enterprises. 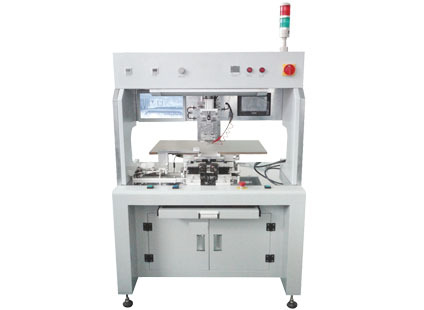 The working principle of COG bonding equipment (preload) is make the attached IC 、ACF’s LCD、LCM assembled and bound in the (LCM) module production, maintenance and production process .using the head pressure, head temperature, bonding time, optical alignment system to make IC、 LCD and LCM、ACF glue bound ,so that it can conduct. TopView co., LTD is professional in research and development, production, marketing, promotion, service equipment, LCD touch screen production equipment and various automation equipment of high-tech enterprises.During the years,has made significant achievements, now has open several branches for different markets all over the world.